October 12-13, 2007. The weekend after the Royal, every year. Arthur Illinois, in the Heart of Illinois Amish Country, in East Central Illinois. 40+ KCBS teams, many top 10, Past champion, 2 years running "Quau". Kids Q, Backyard BBQ, BBQ vendors, Kids Zone, Friday evening Peoples Choice, Side and Dessert Competitions, Beer Garden with live entertainment. I feel about it and love learning more on this topic. If possible, as you gain expertise, would you mind updating your blog with more information? It is extremely helpful for me. Its very great read for me because your writing skills is so good and you will write this post in very good manner. Thanks! We are already looking forward to 2008. Once again the weekend after the Royal, Oct 10-11, 2008. 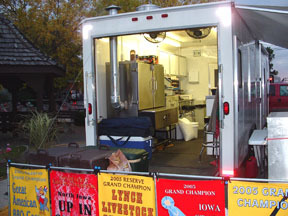 Visit our web www.cibr-bbq.com for event details. Had a great time in Arthur this year. The Heart & Home Bed & Breakfast is a great place to stay. The dessert & side dish event was great. Lots of great food, and great company. Will definitely be back next year.